Im unsure if many people here have heard of this product but seems to be quite promising, and not like another 20 years away either. 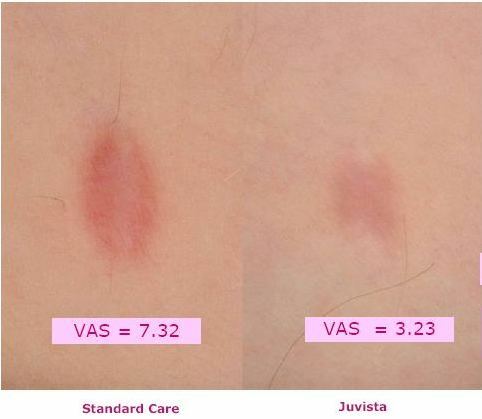 The crux of it seems to be that after an operation, (not specifically acne scar revision) but similar, the companies lead product juvista is injected into the wound margins and scarring is significantly reduced. They appear to have other products as well in the pipeline for internal scarring also. If u were going to have an excision or similar this seems the way to go. Anyways definately worth checking out!!! Thanks to seabs135 for summarising the thread thus far in the above pdf. Interests: Getting rid of my scars!! Unfortunately I think it will be AT LEAST 20 YEARS in the making. I remeber first hearing about this over 7 years ago, and I cannot even believe it is still in trial mode. From the research i've done on this product the release date seems to be set around 2009/2010. Renovo plan to have it on the US market by 2009 and rest of the world 2010. I think 20 years may be stretching it a bit. Even if there are delays im thinking more like 5. Still I'd be skeptical for it to be a magic bullet for scars. So what are you supposed to do? Have an excision and use this technique to prevent the surgical scar and 'depressing' effect??!! I agree with you that it wouldn't be a magic bullet for scars as i don't there is such a thing. 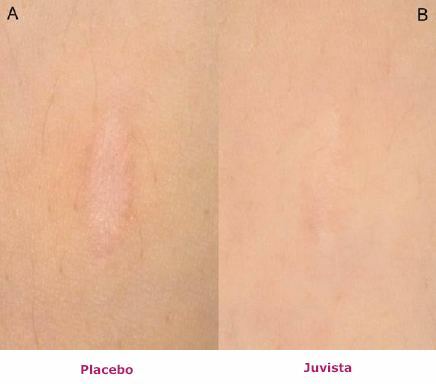 I'm under the impression juvista doesn't claim to prevent the formation of a surgical scar, rather greatly improve its potential appearance and pigment. I think if your skin was going to depress it would do so regardless of whether you used this product or not. Exactly what I was going to post!! People on here need to understand that depressed acne scars are there for life, you go to your grave with them. They are now just as much a part of you as your eye color. I have spent thousand and thousand - silicone injections dermabrasions, excisions- anything and everything. And not ONE ounce of visible improvement!! My feelings on excisions is that it is partly due to the doctors skill, your own healing and after care (staying out of the sun etc) From personal experience i have had 2 moles excised due to doctors reccomendation. One from back of my neck another on lower back, one healed better than the other but neither was indented after the excision healed and the one that healed worse was due to my poor aftercare, i went out into the sun all afternoon the same day of the operation. I've read both good and bad about excision from here so i think it's a 50/50 chance. But please keep in mind (and I have told thousands this same thing over the years) that DEPRESSED acne scars are different. You are trying to excise an indentation, NOT A MOLE. Excising a pit is much harder and you can't ever expect to have it completely flat. Trust me on this. I've been to many PS and derm surgeons and have had several excisions with each. Take it from me who has actually had it done and knows the true results. I have done this exercise time and again. I have explained this to posters on here time and again. I'm terribly sorry to hear of your experience Ylem, so all of your excisions didn't work? Were any slightly better or were they all for the worst. Did you discuss this with your various PS? I was reccomended excision and the PS seemed confident which shocks me if he knew that a poor result was likely. 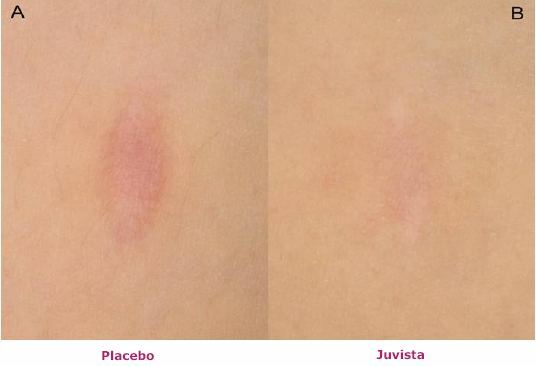 I've read some articles on Juvista and it's supposed to be a miracle for existing scars as well as preventing new ones. Existing scars can be markedly improved with just two injections, with the cost estimated to be less than Botox. I hope this thing hits the market soon. I as reading through this thread in regard to excision. Many of these people stated that they have had good results after the excision. If any of these people are still using this site, please feel free to add your 2 cents. Did you feel it was worth it? Or would you never go near it again? I am quite surprised that other forum members aren't paying much attention to it but I'm sure it's mainly due to the fact that it is still without a tangible product. However, both the research and the results from the past phase I and phase II clinical trials show AWESOME promise in terms of scarless healing which we are all hoping for. The current status of the company is that it is now deep in discussion with Big Pharma with the aim of arranging a licensing agreement for its products. It's currently in talks with Pfizer, Novartis and Allergan to name a few and a deal is supposed to be reached within two weeks. What does this mean? Well with the added financial backing of a large multinational pharmaceutical, Renovo will be able to start it's final phase III trials for Juvista and it could fast track the product for launch by 2009 and possibly even earlier in 2008. How can Juvista help remove acne scars?. 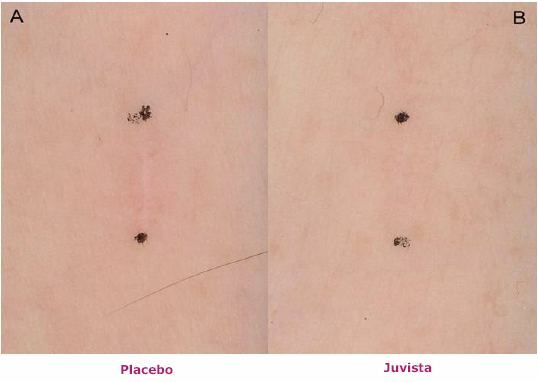 Well for depressed acne scars, the scar tissue would be excised in the same manner as it is currently done but once stitched up the Juvista drug will be injected into the walls of the wound to prevent scar tissue formation. Prior to surgury, the acne scar will also be injected with the drug as well. Once the wound heals, the stitches are removed and the skin should be raised and level with the surrounding skin due to the collagen production and the manner in which the drug inhibits scar tissue formation. The cost of a jab of Juvista is anticipated to be about $275 or Â£150 which if you ask me isn't too bad especially since there are no return treatments needed once the procedure is carried out....unlike Fraxel which is a complete waste of people's money and produces absolutely minimal results. I can't say whether or not this drug is 'the magic bullet' for us all but I sure as hell am hoping it is and all the evidence/articles suggests that there is immense promise!!! Moreover, I know that this will probably be the best available treatment on the market. Everything else: needling, fraxel, punch excisions etc... don't solve anything. The cost of a jab of Juvista is anticipated to be about $275 or Ã‚Â£150 which if you ask me isn't too bad especially since there are no return treatments needed once the procedure is carried out....unlike Fraxel which is a complete waste of people's money and produces absolutely minimal results. While it seems logical Juvista would work this way for depressed scars, we don't know that for a fact, and I don't see any evidence of clinical trials to support this whatsoever. Remember, and I have learned this hard-to-accept fact over the years, often what we perceive to be the outcome on DEPRESSED scars is never like the true result. This product may be more effective in preventing SURGICAL SCARS. And many realize ATROPHIC scars function quite differently. There are other reasons for pitting, and these reasons have not been determined conclusively yet. I do not feel confident at all this drug would counteract the pitting in any way. To me it seems like it would be more effective for hypertrophic or keloid scars, where excess tissue is layed down during wound healing. It probably has a mechanism to inhibit that biological process, but PITTING is different. The term scar is too blanketed because all scars are different. Bottom-line, I am not at all excited about this until I see evidence of clinical trials on treating atrophic acne scars. Too many products, including Fraxel, are touted as being effective for acne scarring when in fact there are no clinical trials done to support these claims. Fraxel is FDA cleared for Melasma and photodamage, NOT acne pitting. I would agree it will probably be a waste of my money, even though it is all I can cling to at this point. It is my last resort. So, NECA, did you try Fraxel 2 and at what settings? Nothing I have done has ever made me worse. IT just hasn't had any notcieable cosmetic effect. Transformative Growth Factor Beta 3 (TGF B3) is the active ingredient in Renovo's line of treatment. Scar tissue, whether it is the thin membrane that stops depressed scars from filling in or the thick fibrous kind in keloids, is caused by the excess of Transformative Growth Factor Beta 1 (TGF B1). I've been following Renovo for about five years in the hope that this would ultimately be the answer, and it will definitely help. However, until you can completely suppress TGFB1 the body will try to create a seal to a wound and that seal is scar tissue. Back when all of us were in a fetal state, TGF B3 had dominance and in fact if you take a fetus out of the womb and perform open heart surgery and place it back in the womb, at the time of birth a few months later the baby will not have a scar. The fetus regenerates instead of sealing. It could be that in order to creat the environment for scar free healing you would need to really flood the new wound with the TGF B3. Once I saw Renovo's pictures on their website for treatment of excisional wounds I was actually a little disappointed in that ,while the scars were improved, they were still THERE. I am not giving up hope as a LOT of money is being thown at this issue. Transformative Growth Factor Beta 3 (TGF B3) is the active ingredient in Renovo's line of treatment. Scar tissue, whether it is the thin membrane that stops depressed scars from filling in or the thick fibrous kind in keloids, is caused by the excess of Transformative Growth Factor Beta 1 (TGF B1). I've been following Renovo for about five years in the hope that this would ultimately be the answer, and it will definitely help. However, until you can completely suppress TGFB1 the body will try to create a seal to a wound and that seal is scar tissue. Great post Anna, thanks for your input. I totally agree with you, a lot of hype, claims and money have been put into this product making a lot of us people with scars incredibly excited. But I too was a little disappointed to have seen their results from the previous phase I and II trials that were supposed to show the products' ability of scarless healing. 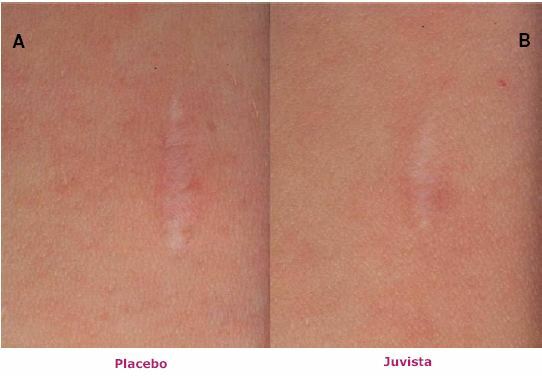 The pictures of the effectiveness of Juvista gave the impression that the drug would only improve the scars ie make them less physically noticeable as a result of the drug inhibiting some scar tissue growth, however there would still be some unevenly woven fibroblast-type tissue present. However, remember that the photos are quite magnified so if view with the human eye at arm's length distance, the improvement would seem better. But I guess this can't be too disheartening since Renovo is still experimenting with the dosage, type of scarring to operate on and which part of the body responds the best. Apparently the skin on the face heals more efficiently than other parts of the body so that could be a bonus. I have attached SIX pictures produced by Renovo showing some of the results of the trials. There is clearly a large variation in terms of the efficacy of the product but this is probably due to the variables I have already suggested so far. So you would think, given the above evidence, the best way to create a product that prevents scars in humans would be to replicate what happens in fetus' ie create a product that inhibits the production of TGF1+2 AND include a high amount of TGF3. HOWEVER, Renovo has not done this; instead, Juvista only includes TGF3, and their other product Juvidex includes only a TGF1 inhibitor. 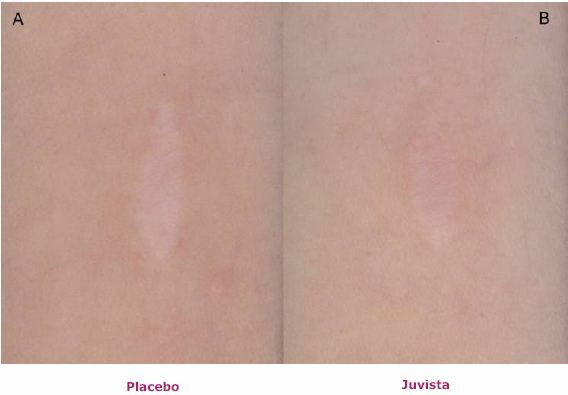 So when you cut yourself and apply Juvista you will get the benefit of having TGF3 applied to the wound, but the drug does NOTHING to do the TGF1+2 substances which we don't want as they are likely to influence scar production and provide the unwanted inflammatory response. On the other hand, if you only applied Juvidex to a cut you would only benefit from inhibiting JUST TGF1 whilst TGF2 is still left to produce; at the same time the drug does nothing about the low level of TGF3. This might slightly explain why their pictures aren't that impressive. No Ylem, I haven't tried Fraxel 1 or 2, but having seen a friend waste $3K+ on it, I can definitely say I will never try it no matter how desperate I am. The cost-benefit of that treatment is just not worth it and I am disgusted when I see derms/docs touting Fraxel/lasers as an excellent method of 'treating' acne scars. They are just making money off people who have very little alternatives. You see, people want to think they are doing something, no matter if it doesn't work, as long as they feel they are doing something then psychologically feel better about themselves regardless of the fact that their scar may still be there or has even become worse. I can understand that we are all in desperate need of getting rid of these damn scars but I don't want to be ripped off any longer. I spent my entire journey through acne being ripped off by millions of products that claim to cure my acne but if anything they made everything worse. So now, I am just trying to sit tight and go for something that has medical evidence. Thank you for your post Neca! I am glad to see someone on the board who has high hopes that a real answer is in the offing and I will look forward to seeing your pictures populate...it looks like they are still waiting for approval right now. I am confounded too by the formulation of Renovo's treatment. I actually chatted with some of the folks at Renovo a few years ago and there was some talk at that time of having the assess a patient's natural levels for TGF B1,2,&3 to make a custom concoction to specifically address each individual's needs. That seems to have gone by the wayside...maybe, at least for now. Have you read about some of the work being done by DARPA and ACell involving tissue regeneration? I think perhaps it should be marketed as scar less than normal healing. What i sumised from the product details would that you would scar less than you normally would not that you wouldn't scar at all. At the moment it appears juvista is targeted for the surgery market. The possiblility for people who have serious scars (im talking about burns, things of that nature) seems to be in one of their other products which is still in phase 2. At this point, that would be a more accurate description Tom. The banner on Renovo's website used to read "Scarless Healing" but they seem to have taken that down. They really are pushing the investment potential rather than the substance of efficacy...what's new?! I have no problem with somebody making a healthy profit if their product really works. I am quite a bit tired of the disappointments though! there was some talk at that time of having the assess a patient's natural levels for TGF B1,2,&3 to make a custom concoction to specifically address each individual's needs. That seems to have gone by the wayside...maybe, at least for now. Now that would have been a great idea had they decided to go down this route but it's not surprising they didn't. In today's world corporations aim to make profit rather than primarily cure health problems. Can you imagine how much it would have cost Renovo had they offered custom made formulations. Moreover, by splitting the TGFs into two different products that aim to do two slightly different things they can make more money by targeting different markets. Have you read about some of the work being done by DARPA and ACell involving tissue regeneration? The banner on Renovo's website used to read "Scarless Healing" but they seem to have taken that down. They really are pushing the investment potential rather than the substance of efficacy...what's new?! I have no problem with somebody making a healthy profit if their product really works. I am quite a bit tired of the disappointments though! Renovo is a biopharmaceutical product company and is the world leader in scar prevention and reduction research and the development of drugs to prevent and reduce scarring at multiple body sites including the skin, eyes and nerves. A world leader in scar prevention and reduction research is not the same as one that actually produces products that prevent scars. And why would you develop drugs that can prevent AND reduce scarring; surely if it prevented scarring then you wouldn't need something that reduces them? Anna, again, I think you are correct; the chief execs realise the investment potential of Renovo and how much money they can make by signing a licensing deal with Big Pharma which is probably why they decided against custom made preparations in favour of mass produced TGF3 preparations. Yes definitely Tom. it should be marketed as scar less rather than scarless healing. Once an incision is made and the drug injected you will still scar but 50% less than had you used nothing or a placebo. The thing is the stock market is currently quite excited over the prospects of making profit from this company. When Renovo initially listed, its share price was around 80p, now it's hovering around 180-190p and this will almost certainly double once a deal is declared in a few weeks time. After that the growth of the price will be pretty strong once the products are released. In investors' eyes, Renovo's drug don't have to cure scars or prevent them to be profitable, instead the products just have to be a better alternative to what is currently on the market ie silicon sheets and standard scar revision. This fact is a real shame because had they used custom made formulations it would be most probable that we would be dealing with something that almost DEFINITELY cures/prevents scars 99%-100% of the time!!! ...Maybe there might be another company willing to do this ? DARPA (Defense Advanced Research Projects Agency) is funding a project meant to jump start tissue regeneration out of necessity due to extremely high percentage of soldiers coming home permanently injured in the Iraq war. In previous wars for every one soldier that died two came back permanently disabled. In this war for every one soldier killed nine are coming back permanently disabled. Imagine the cost...my thoughts are emotional costs...I'm sure the government is more concerned with the financial costs. DARPA is funding ten US universities with a fast track project of trying to create a blastema and then regenerating a finger. I'll get the links loaded to this post in a bit. It will be nice to get some competition in the field of tissue and limb regeneration! I wouldn't be surprised if some emerging (previously third world) company leapfrogs all of them! I am especially intrigued at the prospect of the studies of the MRL mouse that regenerates tissue. In this case the mouse initally creates a seal but is still able to regenerate holes punched in its skin by catabolically digesting the scar tissue and progressing to perfect regeneration. Moreover, when cells from the MRL mouse were injected into non-regenerating mice those mice were also able to regenerate. Amazing! And the worst part is I keep trying everything and it has all failed. I can't help but obsess over it because It continues to gradually look wrose.